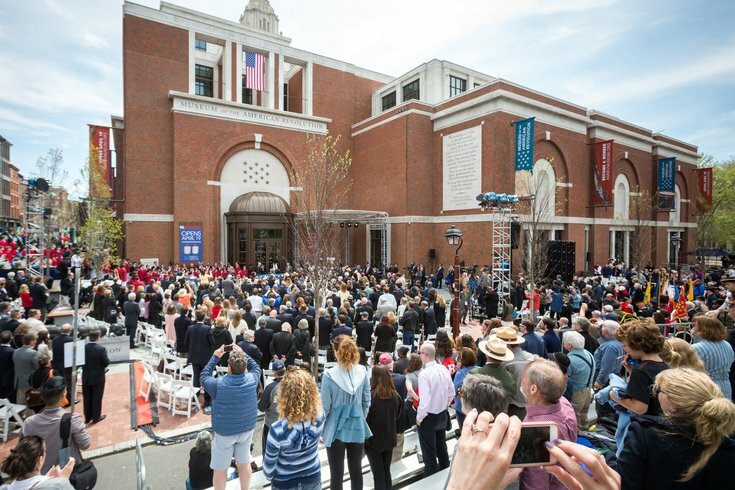 Hundreds were in attendance on Wednesday, April 19, 2017, for the opening of the Museum of the American Revolution. For adults who had read about the Revolutionary War in history books, and for children yet to learn about it, the wonder was evident in their eyes. The opening of the state-of-the-art Museum of the American Revolution has breathed new life into a dusty narrative of how America broke free from Britain, with the blood, sweat, and tears of European rebels, native people, and those both free and enslaved of African descent. GALLERY: Museum of the American Revolution officially opens. The ribbon-cutting and ceremony took place Wednesday morning in Old City, appropriately, on the 242nd anniversary of the “shot heard ‘round the world” – the day that ignited the Revolutionary Way in 1775. 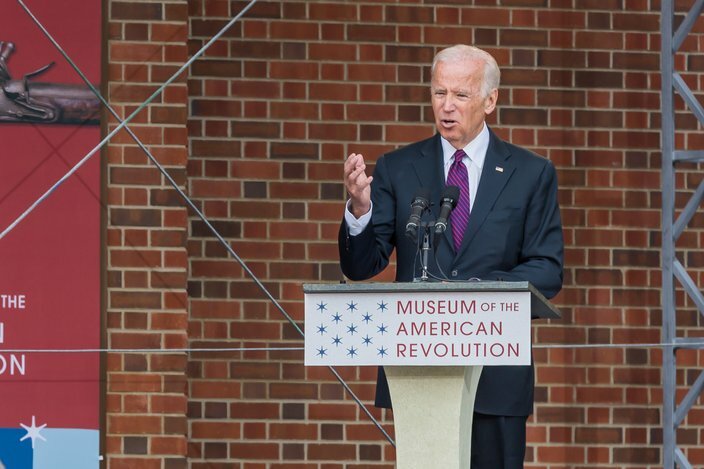 Former Vice President Joe Biden was the keynote speaker for the official opening of the Museum of the American Revolution, Wednesday, April 19, 2017. A wide cast of speakers marked the day’s opening ceremony, with former Vice President Joe Biden delivering the keynote address. He reminded the crowd that came to see the museum’s opening of the "revolutionary idea" the Founding Fathers had when they banded together to break off from England and form a new nation. “The revolutionary notion of the consent of the governed – it seems to me, that’s ultimately why they say America was an idea; the idea that people could govern themselves. Not a monarchy. Not a governmental system that conferred power on the elite or the military or only the educated,” he said. The day’s grand opening celebration was punctuated with musical guest Sydney James Harcourt from the original cast of “Hamilton” on Broadway, who was accompanied by the Philadelphia Boys Choir and a brass quintet from the Curtis Institute of Music. 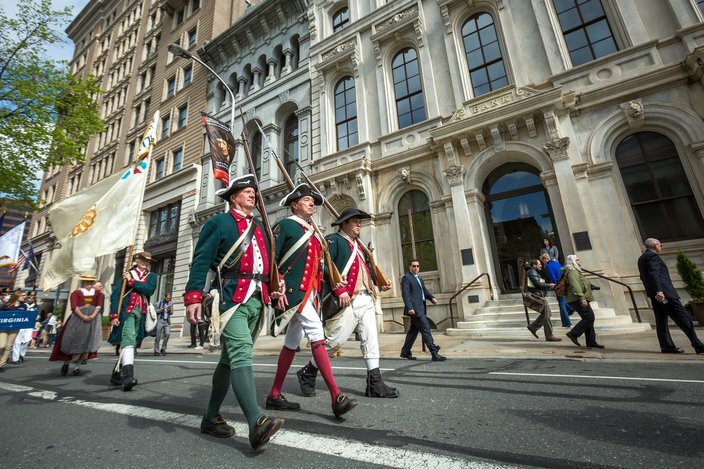 Revolutionary War reinactors march along Chestnut Streets before the official opening of the Museum of the American Revolution, Tuesday, April 19, 2017. Located at Third and Chestnut streets, the new museum encompasses 118,000 square feet of permanent and temporary exhibition space for galleries, art collections, theaters, educational areas, a café and a retail store, all designed to bring the people, ideals and events of the Founding Fathers to life. The museum boasts several thousand rare objects that span the Revolutionary War era, including original silver camp cups from George Washington’s field equipment, the first newspaper printing of the Declaration of Independence, muskets commissioned by a Philadelphia gunsmith and 18th-century slave shackles so small they could fit a child. 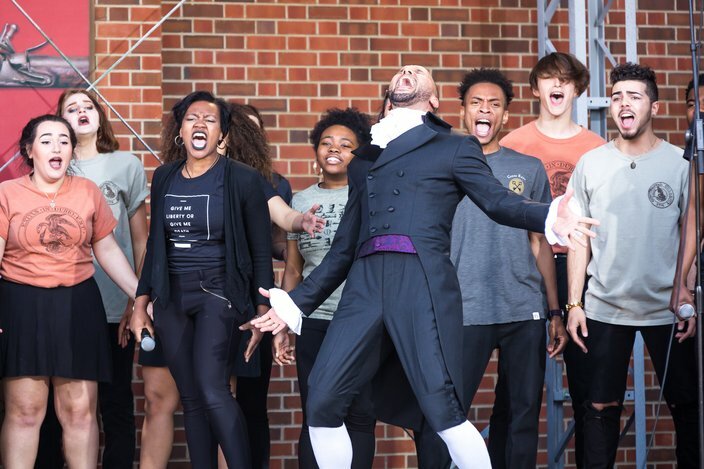 Sydney James Harcourt, from the original cast of Broadway's Hamilton, was accompanied by students from the Philadelphia High School for the Creative and Performing Arts, in the singing of two Hamilton songs during the official opening of the Museum of the American Revolution, Wednesday, April 19, 2017. Gov. Tom Wolf spoke. So did Mayor Jim Kenney, Pulitzer Prize-winning author David McCullough, ABC News and NPR political commentator Cokie Roberts, and Ray Halbritter, an Oneida Nation Representative. “I’m here on behalf of the 1.7 million men and women who have either given their lives or have been wounded in combat serving to protect the freedoms that we’ve all come so much to taken for granted,” said retired Col. John Bircher III, a Purple Heart recipient. The $150 million campaign to erect the museum was done so with the help of donations from every state in the union, as well as from H.F. "Gerry" Lenfest, the Commonwealth's Redevelopment Assistance Capital Program and the Oneida Indian Nation. Biden ended his remarks by stating that the U.S. is the only country in the world whose national anthem ends with a question.